This week I'm beginning a new sermon series based on the bestselling book by Craig Groeschel, The Christian Atheist: Believing In God, But Living Like He Doesn't Exist. More than a few of us Christian-types say we believe in God, but we live like we don't. 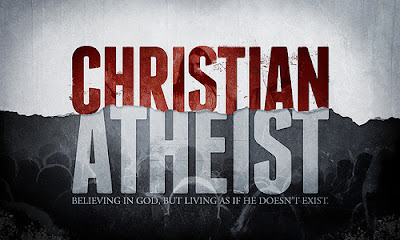 Over the course of the next three weeks we'll be examining some critical areas where Christians stumble and become Christian Atheists--people who claim to believe in God, but who live like he doesn't exist. This week we're going to be exploring what it looks like when you say that you believe in God, but don't really know God. There is a big difference between believing and knowing. Lots of people claim to believe in God, but how many people really know God? And can you really know God? Is that possible? Can you know the unknowable, describe the indescribable, define the undefinable? I think that you can. The key to knowing God comes down to knowledge. Check this seriously profound thought: In all the world there are only two kinds of people: those who know and those who do not know; and this knowledge is the thing which matters. You can feel free to write that down. I stole it from somewhere that I can't recall at the moment. So what is knowledge? Well, here's one possible definition: beliefs that are obtained by reasoning about the available information and nothing else. In other words, knowledge is what you come to know because of what you see, hear, touch and experience---what's right in front of you that you can't possibly ignore. I read this Sherlock Holmes story once where Holmes was surveying a crime scene and was asked if there was anything he thought curious about it. He told the detective asking question that he found the dog in the house curious. "The dog did nothing," he was told. In fact, the dog had remained quiet the whole evening. "Exactly," Holmes replied, "which leads me to believe that whoever committed the crime knew the dog." Knowledge is gained through experience. You might believe that your chair will hold you up, but when you sit in it, you'll know. But knowledge of God doesn't just end there. When you experience God, when you have intimate knowledge of God based on what you know, then you are transformed. The difference between believing in God and knowing God is revealed through transformation. It's the kind of knowledge that helps you say, "I was an addict, but now I am sober." or "I was unfaithful in my marriage, but now I am true." "I used to live one way, that had no purpose or meaning but now I live another way..."
I want to talk about three kinds of people: Those who don't really know God, Those who sort of know God, and Those who know God intimately. The reason I want to take the time to talk about all three of these kinds of people is because I am betting that most Christians identify with at least one of them. 1 John 2:3-4 reads thusly, "3 We know that we have come to know him if we keep his commands. 4 Whoever says, “I know him,” but does not do what he commands is a liar, and the truth is not in that person." Here's the thing, the Scripture here doesn't mine words. If you are the kind of person who claims to know God, but then lives exactly like God doesn't exist---you're a liar. This is the kind of person who is fully aware of the fact that their knowledge of God is deficient, and they don't really care a whole lot. This is the kind of person who is seriously going through the motions when it comes to acting like a Christian when it suits them. I did some research on the old phrase, "liar, liar pants on fire... hanging from a telephone wire." It was attributed by some people to the great poet William Blake, but that has proven to be false. What we do know is that it denotes that the person who is a liar will not only be found out, but their lies will be put on display for all to see. Christian Atheists who don't know God often think they are getting one over on everyone, but eventually the truth of what they believe always comes to the surface. It doesn't take much to move from a person who doesn't know God to one that does, though. My father was raised in a good home that wasn't overtly Christian, and never really gave much thought to his faith. He believed in God, but didn't know God. When he was in the Navy, he began to realize that there was something missing from his life. He had a deep sense of loss, and a lack of meaning. One day in a moment of desperation, my dad cried out "God help me!" Some time later my dad saw a guy on his ship walking around with a Bible. He asked the guy if he really believed what was in it, and the guy started sharing his faith with my dad. Eventually, he encouraged my dad attend a Christian college, and also introduced him to my mom, who was a family friend. In Galatians 4:8-9 we have this: 8 Formerly, when you did not know God, you were slaves to those who by nature are not gods. 9 But now that you know God—or rather are known by God—how is it that you are turning back to those weak and miserable forces[a]? Do you wish to be enslaved by them all over again? Once I spent the entire day with the actor John Lithgow. I was part of a film crew that was filming a television show he was shooting at Walt Disney World. I got the chance to hang out with John Lithgow, eat lunch with John Lithgow and even talk to John Lithgow. But if I said that I knew John Lithgow, that wouldn't exactly be true. He has no idea who I am. I do not have his cell phone to text him. I don't know where he lives. Some people have met God, but they don't really know him all that well. They show up at church, and say things like "showing up is half the battle." They're right. It is half the battle. But there's this whole other half of the battle that they can't ignore. Having God as an acquaintance isn't going to cut it if you want to live a transformed life. Serious question. Do you long for God in an indescribable way? Does this Psalm sound like the way you feel about God? This is what it's like when you know God intimately. You long for God. You can't get enough of God. I spend the first thirty minutes or more of my day spending time with God. I didn't always do this, but when I began making it the first thing I do each day, it changed my life. I have discovered that if those first thirty minutes don't happen, then everything gets messed up. I feel disconnected from God and my life doesn't seem balanced. The more I have done this, the more I want to do it. The more I want to spend time in prayer, and reading my Bible. In fact, some days I find myself wishing that I could spend my whole day doing nothing but praying and getting to know God better. The more time you spend seeking to know God, the more time you want to spend seeking to know God. At this point, you might well ask, "So how can I know that I am getting to know God better?" There's probably a bunch of ways, but I'll outline three. What do you call God? If you know God, you are likely to be more specific about what you call him. My wife has a nick name that she uses for me. She's the only person in the world who calls me by this nickname. I am not going to share this nickname with you because then you would use it and it wouldn't be special. My wife uses this name because she knows me better than anyone. When she uses it, I know that she loves me, and that she's feeling especially fond of me that moment. Is God your Creator? Messiah? Redeemer? Shepherd? Guide? Defender? What you call God is an indication of what your relationship with God is like. Do you trust the future? So many people are chained to their past are paralyzed in their present and terrified of the future. When you begin to get to know God, you realize that you can let your past go and be healed from it. All of the things you thought unchangeable about your present can be changed. And you can begin to plot a different course for your life that is full of hope. How do you react when things go badly? If you know God, then it doesn't matter what happens in your life, you will eventually find your way to a place of trust. I heard a story of a woman named Ruby who prayed fervently for her husband to become a Christian. He never made the commitment and died tragically and suddenly. She became bitter and angry at God, and gave up on her faith. A young man named Roger got discharged from the Army and began hitchhiking home. A man in a fancy car pulled over and offered him a ride. The man said he was going to Chicago, where he had a successful business. Roger wasn't going to Chicago, but was heading in the general direction. As they drove, Roger, who was a devout Christian, decided to share his faith with the man. The man became overcome with emotion and pulled the car over where he prayed and accepted Christ. He told Roger that he was going to change his life for good, and that the change was long overdue. The man told Roger if he was ever in Chicago to look him up, and handed him a business card before driving off. Years later, Roger found himself in Chicago and looked the man up. He went to the business address on the card but was told when he got there that he would not be able to see the man on the card, but could meet his wife who ran the business. Roger was introduced to Ruby who informed him that her husband had been killed in a car wreck five years earlier. As they talked, Roger discovered that the car crash had occurred on the very day that the man had given him a ride. He told Ruby about what happened that day, about how her husband had accepted Christ. She fell to her knees and began to weep uncontrollably. She told Roger that she had always thought that God had never answered her prayer, and had given up on her faith as a result. All along, God had been faithful--and was weaving a story that she could not have ever imagined in a millon years. Maybe you've been thinking of giving up on God. Maybe you've already given up on him. Maybe your relationship with God has been so tenuous or non-existent that it doesn't take much for you to walk away from him. Maybe you have no idea what it means to long for God, but you wish you did. The difference between believing in God and knowing God is revealed through transformation. If you seek a true relationship with God, you will discover just how transforming it can be. In fact, when you have a real relationship with God nothing in your life will remain unchanged.